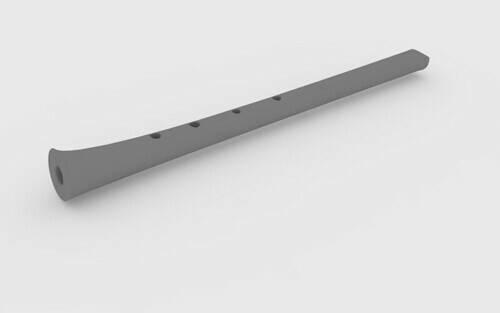 A friend of mine is doing a 3d printed flute project at Mit Media Lab, next week will do a 3d printed shakuhachi. I own couple of good shakuhachi. Good ones but not special. Is there anybody out there who has bore measurements of other data of great flutes that we can use for this project? Please email me privately with the data! Measuring a bore is a pretty complex process and not always accurate. In case you don't receive any new profiles there are some already available. Here are measurements for a 1.8 which have been averaged. In Masayuki Koga's manual there are also some detailed, slightly wider bore measurements. Carl Abbott also has some basic measurements in his "Blowing Zen" manual.